As a small business startup we spend a great deal of time looking at our data and analyzing that data to help us drive strategy, make adjustments, and better understand our customers. We try hard to not be robotic in our response to numbers, but rather to let them inform our decisions and our direction and we believe that this is how all small businesses should use their own data. Here is the third in what will be a serial discussion of some of the data we look at internally, the numbers we analyze, and our strategic approach with this data. This week and next I want to talk to the creatives in the room. You’re busy people, right? You have lots to do and not enough time to do it? A job, a family, your friends, and plenty of interests outside of crowdSPRING? So let’s see how I can help. Using some of our data, I have come up with some tricks that may help you to maximize your efforts. The goal is to succeed on crowdSPRING, right? Earn some money while you do what you love? This week and next I’ll share some data that could help guide your decisions about which projects to participate in and when to participate. Today, we’ll cover the “which.” We’ll look at the numbers on project awards and project participation, and hopefully help you develop your own strategy for choosing projects, using a statistical approach. Now this approach may not fit with your own decision making process, but maybe it gives a little food for thought? In addition to the projects you just WANT to work on – maybe because they are just cool – you might consider a couple of other factors such as, which projects pay the most? Or, which projects have lower participation so that I stand a better chance? The first question is easy, and is answered by the first chart. 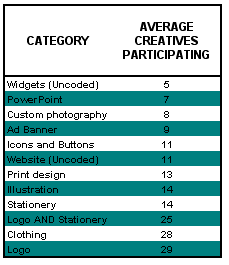 Web Design projects pay the most of all of the categories while logo design is closer to the median. 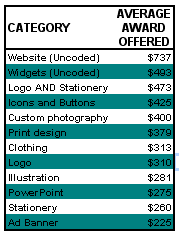 If you strictly want the highest payout for your work, get in there and enter some great web design projects. The second question offers a different, and less common approach to choosing projects.I took a look at participation levels for each category of project and it is clear that there are projects on the site with less competition where you can jump in and really wow the buyer. Want the best odds? Easy. Just enter every Widget project that we host.